When he heard of this, the Lord King Charles rushed to the place with all the Franks he could gather on short notice and advanced to where the Aller flows into the Weser. Then all the Saxons came together again, submitted to the authority of the Lord King, and surrendered the evildoers who were chiefly responsible for this revolt to be put to death – four thousand five hundred of them. The sentence was carried out. This entry for the year 782 in the Royal Frankish Annals is one of the most debated topics of Charlemagne’s reign. Did the ‘Massacre of Verden’ actually happen with 4500 people being killed in a single day? Was the Carolingian ruler (and later Holy Roman Emperor) justified in his actions? Or was this a brutal act of ethnic-cleansing that has left a terrible mark on the man who is credited with re-establishing Western Europe after the fall of the Roman Empire? Charlemagne’s reign (768-814) was one of almost continuous warfare – you could find his armies fighting in Aquitaine, Lombard Italy or south of the Pyrenees against the Muslims. However, his longest and most difficult war was against the Saxons in what is now northwest Germany. The Franks and the Saxons had long been adversaries, but their conflict had been relatively low-level: raiding on both sides and imposition of annual tribute. However, soon after the death of his brother and co-ruler Carloman, Charlemagne decided to invade Saxony. The campaign, which took place in 772, was a major success. The Franks captured Eresburg, took captives, plundered gold and silver, and most importantly, destroyed the Irminsul, one of the most holiest places of the pagan Saxons. No war ever undertaken by the Frankish people was more prolonged, more full of atrocities or more demanding of effort. The Saxons, like almost all the peoples living in Germany, are ferocious by nature. They are much given to devil worship and they are hostile to our religion. They think it no dishonor to violate and transgress the laws of God and man. Hardly a day passed without some incident or other which was well calculated to break the peace. Our borders and theirs were contiguous and nearly everywhere in flat, open country, except, indeed, for a few places where great forests or mountain ranges interposed to separate the territories of the two people by a clear demarcation line. Murder, robbery and arson were of constant occurrence on both sides. In the end, the Franks were so irritated by these incidents that they decided that the time had come to abandon retaliatory measures and to undertake a full-scale war against these Saxons. Under the leadership of Widukind, the Saxons continued to resist, and for the next ten years we would see a series of Carolingian campaigns and Saxon reprisals. The events of 782 started when Widukind persuaded a group of Saxons who had submitted to Charlemagne to rebel. They went to battle with a Frankish army and annihilated it, killing two of the King’s chief lieutenants. Charlemagne responded by gathering his forces and returning to Saxony, where he unleashed his massacre at Verden. The entry quoted above from the Royal Frankish Annals is our only source for this event – some historians have questioned if these events happened, or were at least exaggerated by the chronicler. It seems unlikely that such an event would have been imagined by the writer considering how ferocious the warfare was between the Saxons and Franks. Moreover, the number of 4500 killed in one day also seems reasonable, with Bernard Bachrach and other historians pointing out that the Carolingians and their enemies could field armies in the tens of thousands. Charlemagne’s losses in 782, according to the Royal Annals, ‘mattered less for their numbers than for their quality’ – some of the king’s closest companions and counsellors, his tent-sharers and the men of his hall. A good lord could not fail to respond ‘with alacrity’ to the news of their loss. In contemporary values, the beheadings were doubly justified, punishing the crime of oath-breaking and avenging very special deaths. the most likely inspiration for the mass execution of Verden was the Bible. Exasperated by the continual rebellions, Charlemagne wanted to act like a true king of Israel. The Amalekites had dared raise their hand to betray God’s people, and it was therefore right that every last one of them should be exterminated. Jericho was taken and all those inside had to be put to the sword, including men, women, old people, and children, even the oxen, sheep, and donkeys, so that no trace would be left of them. After defeating the Moabites, David, with whom Charles liked to compare himself, had the prisoners stretch out on the ground, and two out of three were killed. This, too, was part of the Old Testament from which the king drew inspiration, and it is difficult not to discern a practical and cruelly coherent application of that model in the massacre of Verden. 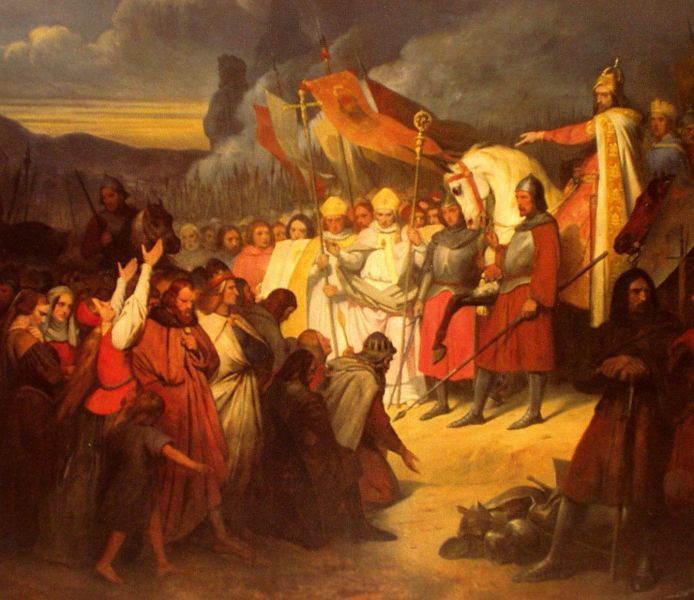 It is difficult to know if the massacre helped end the war – Widukind and most of the Saxons surrendered and accepted baptism in 785 – or inspired a generation of resistance from them as they continued to rebel against the Carolingian Empire. The slaughter may have also helped convince the neighbouring Danes that in order to keep their independence and religion they would need to be aggressive and take the war to the enemy. It would be in 793 that the first recorded Viking attack occurred. The story of the Massacre of Verden again become a major issue in the 19th and early 20th centuries, in particular for German historians who even had to reconcile the Charlemagne who built their country into an empire and the Charlemagne who killed thousands of prisoners in a single day. The Nazis even created a stone memorial to the the Saxon victims in 1935. Even today you will find that this topic gets a wide range of treatment, with some books barely mentioning the events of 782, while others offer stark judgments upon it. Top Image: Charlemagne (742–814) receiving the submission of Widukind at Paderborn in 785, by Ary Scheffer (1795–1858).